Published: June 1, 2014 12:00 am Updated: June 1, 2014 2:06 p.m.
WASHINGTON — Five years a captive from the Afghanistan war, Sgt. Bowe Bergdahl is back in American hands, freed for five Guantanamo terrorism detainees in a swap stirring sharp debate in Washington over whether the U.S. should have negotiated with the Taliban over prisoners. The Taliban handed Bergdahl over to special operations forces in an area of eastern Afghanistan, near the Pakistani border, U.S. officials said. In a statement on its website, the Taliban put the location on the outskirts of Khost province. Bergdahl, 28, was taken to Bagram Air Field for medical evaluations, then transferred to Landstuhl Regional Medical Center in Germany before he is reunited with his family in the U.S., probably at the San Antonio Military Medical Center, officials said. Officials did not offer details about Bergdahl's health. National security adviser Susan Rice said he had lost considerable weight and faced an "acute" situation. Yet she said he appeared to be "in good physical condition" and "is said to be walking." Questions persisted, too, about the circumstances of Bergdahl's capture; Hagel declined to comment on earlier reports that the sergeant had walked away from his unit, disillusioned with the war. Such matters "will be dealt with later," Hagel said. In weighing the swap, U.S. officials decided it could help the effort to reach reconciliation with the Taliban, which the U.S. sees as key to more security in Afghanistan. But they acknowledged the risk that the deal would embolden insurgents, perhaps encouraging them to grab U.S. troops or citizens as bargaining chips for the release of others in U.S. custody. Republicans pressed that point. "Have we just put a price on other U.S. soldiers?" asked Sen. Ted Cruz of Texas. "What does this tell terrorists, that if you capture a U.S. soldier, you can trade that soldier for five terrorists?" President Barack Obama, joined in the Rose Garden on Saturday by the sergeant's parents, said the deal was struck because the U.S. "does not ever leave our men and women in uniform behind." Also Saturday, the five detainees left Guantanamo aboard a U.S. military aircraft flying to Qatar, which served as go-between in the negotiations. They are to be banned from leaving Qatar for at least a year. Among the five: a Taliban deputy intelligence minister, a former Taliban interior minister with ties to al-Qaida leader Osama bin Laden and a figure linked by human rights monitors to mass killings of Shiite Muslims in Afghanistan in 2000 and 2001. Administration officials and lawmakers pressed their points on the Sunday news shows. Republicans said the deal violated requirements that Congress be given 30 days' notice before any exchange of captives at Guantanamo. Rice said "an urgent and an acute situation," which she did not specify, did not allow that time. "We did not have 30 days to wait," she said. "And had we waited and lost him, I don't think anybody would have forgiven the United States government." Several dozen U.S. special operations forces, backed by multiple helicopters and surveillance aircraft, secured Bergdahl's transfer from about 18 Taliban members. He is believed to have been held by the Haqqani network since June 30, 2009. Haqqani operates in the Afghanistan-Pakistan border region and claims allegiance to the Afghan Taliban but operates with some degree of autonomy. "I'm going to celebrate him coming home," said Republican Rep. Adam Kinzinger of Illinois. But the release of "five mid- to high-level Taliban is shocking to me, especially without coming to Congress." As they stood with Obama in the Rose Garden, Bob Bergdahl said his son was having trouble speaking English after his release, although the family had not talked with him directly. 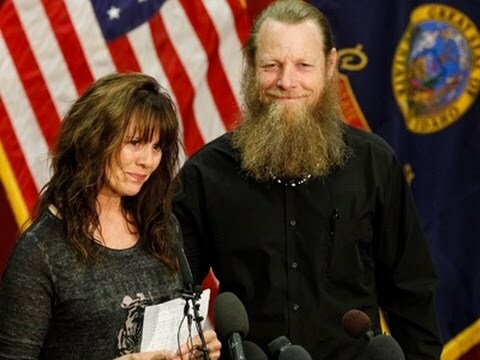 The elder Bergdahl, who grew a long, thick beard to honor his son, had worked to learn Pashto, the language spoken by his son's captors, and delivered a message to him and the people of Afghanistan in that language. The circumstances surrounding Bergdahl's capture remain murky. Hagel brushed aside such questions for now. "Our first priority is assuring his well-being and his health and getting him reunited with his family," Hagel said. A senior U.S. official told The Associated Press that the Army would make the decision on any charges but the feeling at the moment was that Bergdahl had suffered enough. All the officials who discussed details of Bergdahl's transfer insisted on anonymity because they were not authorized to be identified. The U.S. has long sought Bergdahl's release, but there was renewed interest in his case as Obama completed plans to pull nearly all U.S. forces out of Afghanistan by the end of 2016. Officials said the Taliban signaled to the U.S. in November that they were ready to start fresh talks on the issue of detainees. After the U.S. received proof that Bergdahl was alive, indirect talks began, with Qatar sending messages back and forth. Rice spoke on CNN and ABC, Cruz on ABC, McCain on CBS and Kinzinger on NBC. Baldor reported from Singapore. Associated Press writers Deb Riechmann and Darlene Superville in Washington, Rahim Faiez in Kabul, Afghanistan, and Zarar Khan in Islamabad contributed to this report.